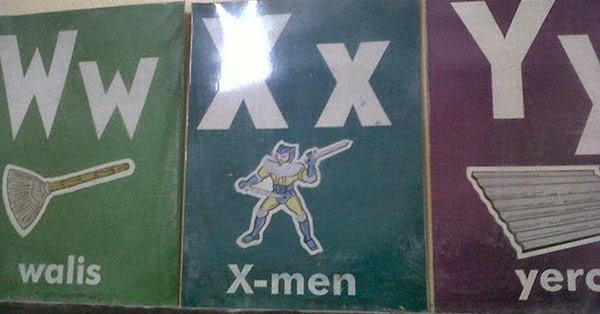 This photo of a Filipino alphabet flash card for letter "X," allegedly taken at an elementary school in Pasig City, is going viral on Facebook. Facebook user JP del Mundo, who posted the picture on Wednesday, May 13, said the picture was taken at "Paaralang Elementarya ng Rosario." He captioned it with: "YOU GO, EDUCATIONAL SYSTEM OF THE PHILIPPINES." Some netizens jumped to the conclusion that using "X-Men" as an example for the letter "X" was due to "lack of words." Others wondered why the fictional mutant characters are being cited as an example when in fact it used to be "xylophone." Have you seen a flash card similar to this in a grade school near you? Should the education department pay attention to this?